Reappearing as a popular weapon during the 12th century, medieval daggers were used as secondary weapon for personal defense as well as a tool for everyday tasks. These double-edged blades taper to sharp points for piercing shields and armor. Our knightly daggers at Buying a Sword make excellent companion weapons for our medieval swords. These traditional daggers come in a range of styles, including rondel daggers, Crusader daggers, Agincourt daggers, arming daggers, swordbreaker daggers, ballock daggers, and more. Certain designs are inspired by historical figures like Henry V, the Black Prince, the Landsknecht mercenaries, and King Solomon, among others. We carry a variety of functional dagger and decorative dagger designs, making these excellent medieval blades for historical re-enactors, Ren fair attendees, and weapons collectors. 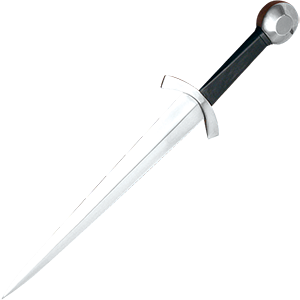 The dagger served as a part of everyday attire during the Renaissance period, worn by commoners and the nobility. 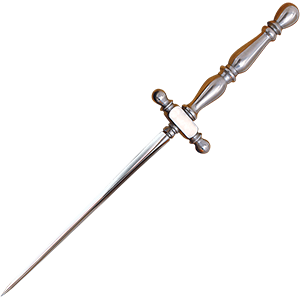 Renaissance daggers were used for personal defense and duels, as well as everyday tasks like eating on occasion. Our historical daggers here at Buying a Sword make great companion weapons for our Renaissance swords. Our Renaissance blades come in a range of styles, including stiletto daggers, poignard daggers, and colichemarde daggers. We carry both functional daggers and decorative daggers, made with stainless steel and high carbon steel blades as well as horn, bone, nickel silver, and wood handles. These re-enactment daggers work great as Renaissance fair accessories and collectibles. 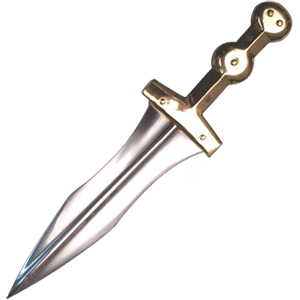 Browse through our excellent historical dagger replicas to find the perfect Renaissance style for your needs. Celtic daggers and Scottish daggers come in many distinctive styles, including the iconic sgian dubh and regimental dirk. Traditional sgian dubhs possess a short blade and make excellent additions to Highland dress. While originally worn as a concealed dagger, they were used for eating as well as defense. Historical dirks, by contrast, served as personal sidearms of Scottish Highland regiment officers with long blades for thrusting. Descending from the ballock dagger of the Middle Ages, Scottish dirks remain popular in modern times as ceremonial blades. At Buying a Sword, we carry a great selection of highland daggers that are perfect for collectors, re-enactors, and anyone who wants to honor their heritage. 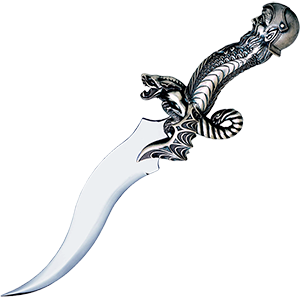 We offer a fine range of decorative daggers with ornate engraving and gems, as well as functional daggers crafted from Damascus and high carbon steel. 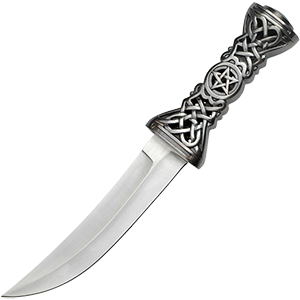 Peruse our Celtic Daggers category to find the right historical blade for your needs. 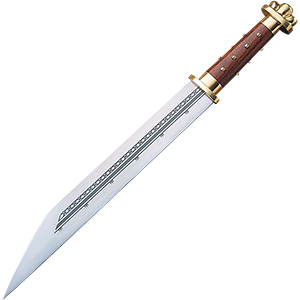 A popular weapon among Germanic tribes, the Anglo-Saxons, and the Vikings, the seax is named for the Old English word for knife. The traditional seax, also called a sax, scramaseax, and scramasax, typically features a blade with a single edge and a centerline tang, which could range in length from 3-4 inches to around 28 inches. Broken-back seax display a dramatic sharp angle between the back and point of the blade. This Viking dagger serves well for fighting and everyday work. Here at Buying a Sword, we carry a great selection of Viking daggers and Anglo-Saxon blades crafted from fine materials like high carbon steel with wood, horn, and bone handles. We offer pieces with darkened and polished finishes. Available in functional dagger and decorative dagger designs, these traditional Norse blades are great for historical re-enactors and weapons collectors. Some of the most unique daggers on Buying a Sword can be found here among our wide array of fantasy daggers! A number of our fantasy blades are inspired by popular media like Conan the Barbarian, Assassins Creed, the Legend of Zelda, and the tales of King Arthur. Others display detailed ornamentation featuring designs like dragons, skulls, spiders, cobras, scorpions, flames, eagles, bats, and more. These functional and decorative daggers display wicked looking blades, many with more than one in their design. Our fantasy punch blades and claw blades, for example, often feature two to four blades extending from the base for extremely intimidating looks. A large number of our ornamental daggers come with a display stand or wall plaque to make it easy to show off your latest find. Whether you want a wizard dagger, an elven dagger, or any other classic fantasy blade design, you can discover fun options here at Buying a Sword!